The American Irish Teachers Association was at the forefront in promoting the issuance of a US postage stamp in commemoration of Ireland’s Great Famine (1845 – 1852). The stamp, which resulted from the extensive AITA campaign, came to be known as the “Irish Immigration Stamp”. It was unveiled at Harvard on July 8, 1998. The enormous outreach work undertaken by the officers and members of the AITA during the administration of Ann M. Garvey involved press releases sent to Irish radio programs as well as Irish affiliated newspapers and organizations across the country. The AITA president was interviewed on the Adrian Flannelly Irish radio program concerning the stamp project and other commemorative initiatives. Letter writing and post card communication reached out to members of the US Postal Commission and people of influence in the political and public realm. 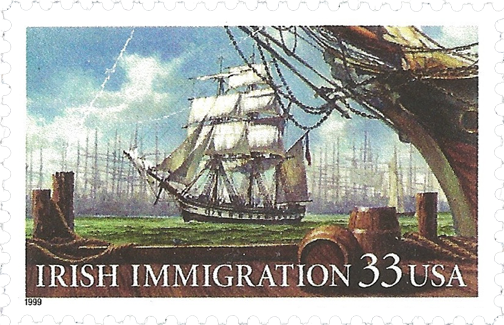 The sailing ship pictured on the stamp is representative of the type of vessel, which transported the million or more immigrants who departed Ireland during the period of mass starvation and the dark days, which followed. At the launching of the stamp, then Postmaster General Henderson noted that stamps have been referred to as America’s calling cards. In the educator’s tool box, the “Irish Immigration Stamp” may also provide an additional resource for communicating the dynamic story of the rich links between Ireland and the United States. In April of 2008, the Institute of Irish American Studies at the City University of New York's Lehman College recognized the American Irish Teachers Association as the "Organization of the Year". Doris Marie Meyer, president, accepted the award on behalf of officers and members at a gala dinner celebration held at Rosie O'Grady's restaurant.